Spending any kind of time with Lorelai (Lauren Graham) and Rory Gilmore (Alexis Bledel) is always, without exception, a delight. Even more so when it’s Christmas, a time so wonderfully magical, even when delayed (more on that later), that it transcends the fact that season 7 of Gilmore Girls aka The One Tragically Without Creator and Inspired Wordsmith Amy Sherman-Palladino was a little to forced and copycat-ish of seasons 1 to 6. Even so, somehow “Santa’s Secret Stuff”, which finds Lorelai and Rory celebrating a delayed Christmas so the latter could spend the big day of tinsel, snow and eggnog with boyfriend Logan (Matt Czuchry) in London – she smells of cookies! No, really, she does – manages to still feel all kinds of warm-and-fuzzy special, even with all the titular secrets swirling around like the non-existent snow. Or one big secret in fact – that Lorelai, who has offered to write a character recommendation letter about Luke (Scott Patterson) for his custody battle over daughter April (Vanessa Marano), might not be entirely over the great love of her life. Why, you ask oh wilful non-devoted watcher, and naturally, re-watcher, of Gilmore Girls, is this a problem? Go with your heart Lorelai, right? Let Cupid do his time-honoured thing! That would all be heartwarmingly nice and Hallmark-y in neon red if Lorelai hadn’t already married her high school sweetheart and father of Rory, Chris (David Sutcliffe) with whom she is happy. That’s a good thing right? Well, yes it is, and the ease and rapport between the two is a pleasure to watch but bubbling beneath it all is Lorelai’s inability to quite pull herself away from the depth of her feelings about Luke, a man who didn’t just supply her with coffee but the kind of unwavering love and friendship that money simply can’t buy. So while Lorelai is delaying Christmas – she has done a no-snow dance and sat in the dark, Christmas tree and present-less to honour her vow to Rory to hold off celebrating the most wonderful time of the year until they could be together – and making cranberry and popcorns chains with Rory and Chris’s daughter Gigi (Nicolette Collier) from his relationship with Sherry, and decorating her house to the nth degree (Christmas trees in each room, mistletoe on the fan to make kissing more of a sport and fake cooking of cookies which isn’t decoative technically but hey … Christmas!) , her heart is consumed with what she’s going to say about Luke in that letter. 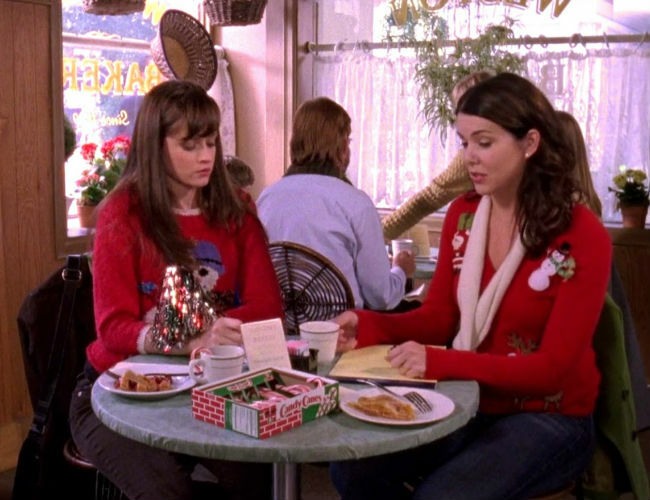 Conscious that Chris is uncomfortable with Luke’s looming presence over their marriage, she avoids his dinner – the cafe they go to doesn’t have peppermint candy cane coffee because, as the owner, points out, it’s no longer Christmas; well, for everyone but Lorelai and Rory anyway – she hides the writing of the letter, and any discussion of it, making all kinds of diversionary talk to throw Chris way off the scent. Rory, in one of their characteristic six million syllables a minute banters, challenges her mother’s epistolic secrecy but Lorelai is unyielding, maintaining she is in love with Chris (it seems she is … but …), is fine about Luke and doesn’t have to sneak off during the lead-up to fake Christmas to post the letter that could mean Luke gets custodial access to April. CHRIS: “What other traditions am I in for? 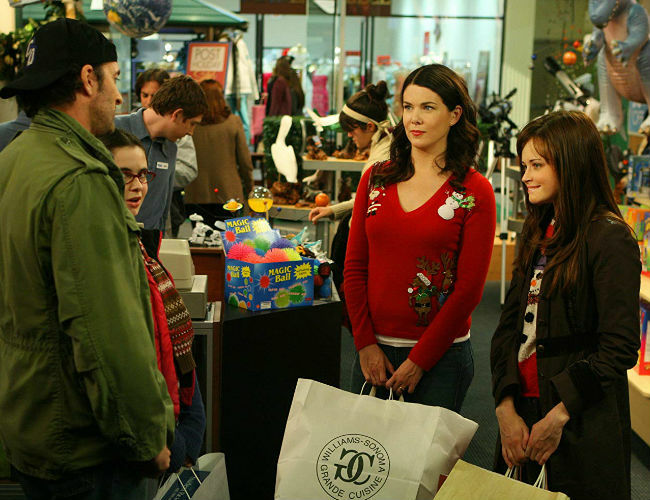 Speaking of whom … April, lying outright to her mother with the kind of detailed deception anyone should be proud of if they weren’t a parent, and Luke is, shows up in Stars Hollow unannounced for her own delayed Christmas with her dad. Luke, of course, is delighted to see, but worried about her presence could affect things, given it could look like he’s trying to subvert the process of law and the fraught custody battle currently waging. April is blithely relaxed about it all; she knows what’s at stake, hence all the wittily-described subterfuge – like everyone in the show, and yes even in season 7, she has quite the way with the word-dense dialogue – but she wants to spend time with her dad and if that means pretending she’s at a museum and reading about the exhibits so she can talk about it with her mum once she returns from not visiting it, then she’s happy to do it. As cloak-and-dagger low key Christmases go, the one that Luke and April share is a joy; they clearly love each other, are comfortable with each other and give great, delayed Christmas presents … well almost great with the rock polisher Luke gives April getting exchanged for a microscope instead. She’s also cranky as hell, throwing generous tips back at well-meaning people, abusing husband Zack Van Gerbig (Todd Lowe) for stacking her drums in a cupboard in favour of giving the room they were in over to a cot, and generally not enjoying her life. A fear of losing her rock-n-roll coolness, of the closing of that brief window of untrammelled identity that fell, all too briefly she regrets on a walk back from Doose’s Market with hubbie Zack, between evading her overbearing mum (Emily Kuroda) and impending motherhood. A brief but truncated band practice, during which there’s less music and more discussion of baby paraphernalia, is the irrefutable sign that life is changing and Lane, mollified by Zack’s assurance that you can still be a parent and the very embodiment of rock-n-roll, finally makes her peace with it. So there you are – peace, love, and festive joy in an episode that comes very close to being quite perfect. 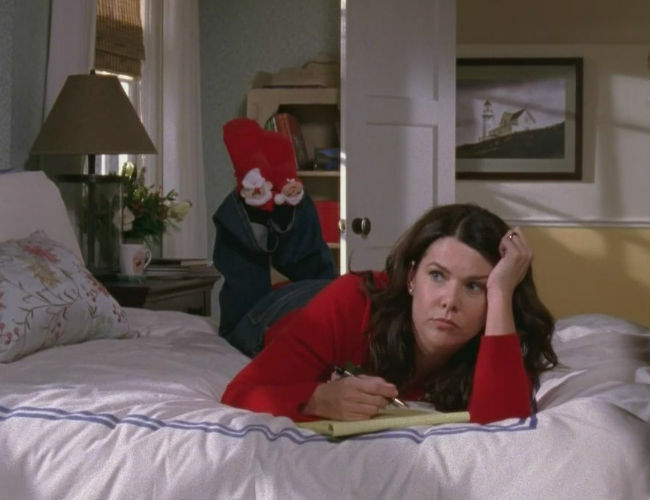 There are Christmas decorations everywhere – well in Lorelai’s house anyway -, shopping for gifts (let’s hear it for Babette’s expletive-filled needlework cushion), secrets and traditions aplenty and most importantly for the later post-season 7 life of Gilmore Girls, the inevitable march towards Luke and Lorelai ending up together which, regardless of the time of year, is pretty much the best Christmas present ever.